Given this is custom one of a kind gun of a Railroad i say this fits, although it lost the James Bond feel. 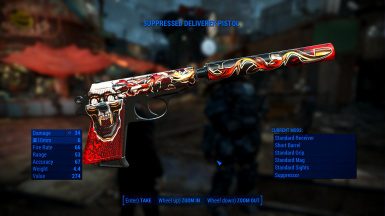 BTW: someone released an USP-45 modded weapon on the nexus maybe you wanna check it out (http://www.nexusmods.com/fallout4/mods/8773/? 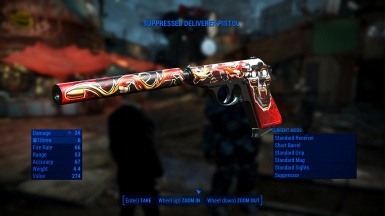 ), your textures look awesome on Deliverer but this weapon will probably fit them perfectly. Also if you're looking to make another Deliverer skin maybe the Guardian skin from csgo? 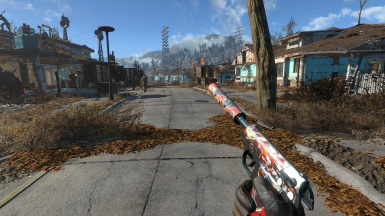 Also got a question, would it be possible to make this mod some sort of a paintjob option in the weapon mod menu like with the Power Armor paintjobs or can this only be done with the CK? 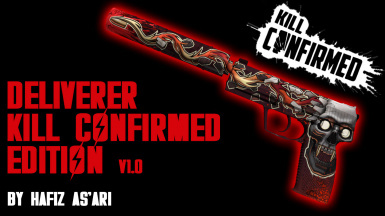 Due to my tight schedule right now,I got no time to do a re-texture project.I've downloaded the mod u mentioned above,thanks for the link.Yeah,the Kill Confirm skin is a perfect match for the mod.I really look into it,but as I mentioned above my schedule is too tight right now I'm sorry. Other than that,we have to wait for a CK for more easier method. Ah ok thanks for answering my questions man. Hopefully the CK will come soon. Success with whatever it is that you are working on currently, and thanks for the awesome mod. I'll PM u the screenshot of the WIP texture and the file as well.Enjoy it bruh. I know nothing about creating textures, but how hard would it be to recolor this to be lime green? Yeah,it just as simple as that.But the hardest part of this retex project is to get the perfect scale between the left and right side of the gun. That's why it took 6-7 hours to get it right.I was quite happy to see the results after so many try and error. That green looks sweet, Any chance you could post a few colors if its that simple. I have no clue on using Gimp,etc. A blue, green and purple would be awesome!! I'd love to see this sort of style on the fully upgraded spray and pray. Okay bro,I'm currently going through the hunting rifle texture.Maybe in the next update,I'm gonna do this KC Deliverer a standalone mod.